LAUSANNE, Switzerland (AP) — Finally, Los Angeles and Paris have their Olympic hosting destiny in their own hands. If they can agree who goes first, each city will be awarded either the 2024 or 2028 Summer Games in September. If a deal falls through, only the 2024 hosting rights will be voted on when the IOC next meets, on Sept. 13 in Lima, Peru. However, an agreement seemed assured, judging by the reaction of the two mayors. 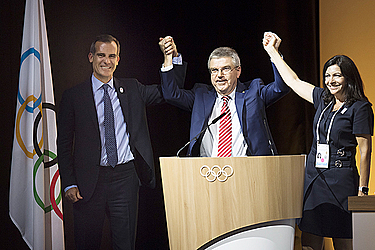 "I have full confidence that we will get there," LA Mayor Eric Garcetti said at a celebratory news conference for both candidates and IOC President Thomas Bach. Garcetti and Anne Hidalgo, his friend and counterpart from Paris, had emerged on stage seconds after the vote, holding hands, to welcome the decision. They were joined by Bach, who raised an arm of each in a shared gesture of triumph. The mood looked set to continue over dinner at the IOC's favored five-star hotel, the Lausanne Palace. The Franco-American alliance continues later this week. U.S. President Donald Trump is due in Paris to join President Emmanuel Macron for Bastille Day on Friday, the national holiday. Macron was in the Olympic capital city Tuesday to promoting the Parisian cause — in a closed-door session with IOC members to explain how they would host the 2024 Olympics, and a subsequent news conference. The presidential push was judged necessary by Paris, which has failed with three recent Olympic bids. "We lost three times, we don't want to lose a fourth one," Macron said at the news conference. "I'm here to convey the message that there's a strong unity to back this candidacy." Minutes after Macron spoke, Trump wrote on Twitter: "Working hard to get the Olympics for the United States (L.A.). Stay tuned!" Even without help from heads of state, LA and Paris are likely to reach a deal. 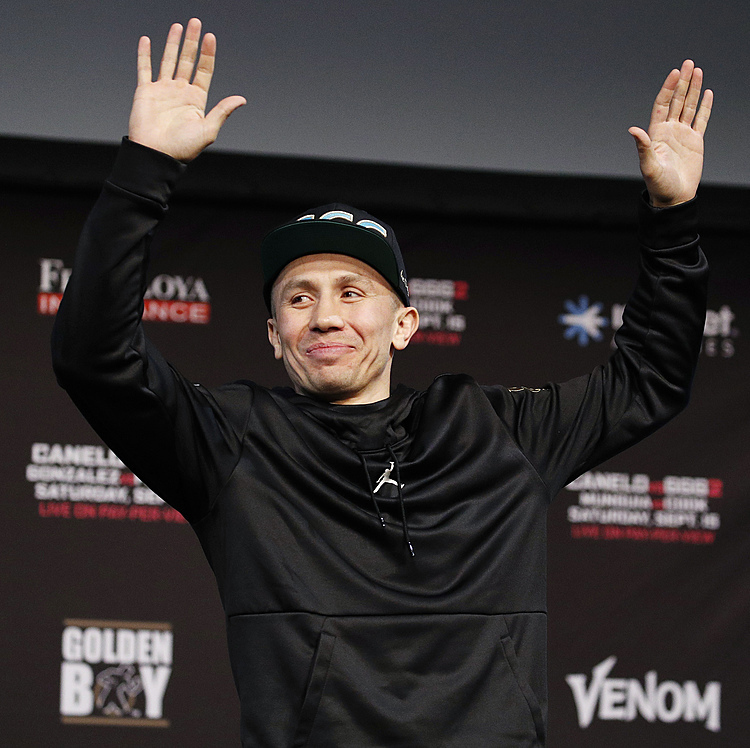 A head-to-head fight for 2024 would create a loser that is unlikely to return four years later for a new 2028 bid contest. "Both of us will find it more and more difficult to convince cities — whether it's Paris, Los Angeles or other American cities — to really go into this process if one of us gets turned down," Garcetti had said earlier Tuesday. A deal to make both cities winners would fulfil a strategy that Bach set in motion last December to help safeguard a stable future for the signature Olympic event. Asked when a 2024-2028 agreement could be sealed, Bach suggested: "If you ask me, I hope that in August we could be there." The IOC approved the expected double award after hearing both cities present their 2024 hosting plans at a conference center in its home city. Both cities used 45 minutes of videos and speeches in a closed-door session with IOC members to explain how they would host the 2024 Olympics. At separate news conferences, the mayors said they could work toward a deal. "We look forward to working together, maybe not in competition but collaboration with Paris," Garcetti said. Garcetti and Hidalgo have long touted their good relations, and on Tuesday noted their cities' common positions on issues such as climate change and welcoming refugees. Hidalgo cited her friendship with Garcetti as potentially a "key element" in the expected deal. The dual award can give the IOC a decade of stability with two world-class cities touting financially secure bids. LA plans to use only existing venues with zero risk of white elephants. This follows years of overspending by Olympic hosts and a series of political defeats that have sunk the campaigns of potential candidates. It also avoids inflicting a third recent defeat on Paris — which lost with bids for the 2008 and 2012 Olympics — and the United States. New York and Chicago both lost heavily for 2012 and 2016, respectively. Those losses deepened a rift between the U.S. Olympic Committee and the Swiss-based IOC that LA 2024 and a new team of American officials have worked hard to heal. Paris also failed with a 1992 bid and pinned its hopes on hosting in 2024, exactly 100 years after its previous Summer Games. Garcetti said the Olympic movement "can't afford to lose the United States." The IOC's most valuable TV rights deal is with NBC and several of its top-tier sponsors are American. Still, a 2028 Olympics in Southern California could be the first American-hosted games since 1996 in Atlanta. Bach has said the idea of a double award was presented to him at a lunch last year by friends whom he declined to identify in a recent interview with French sports daily L'Equipe. The LA bid team declined to comment Tuesday whether the suggestion came from its supporters, as some believe. "He (Bach) has good friends who gave him good advice," LA bid chairman Casey Wasserman said.